Lesley was our first Chairman and led the LRTA diligently and with great enthusiasm for its first ten years. In this period it became responsible for running the British Open singles and doubles and the Ladies Handicap tournaments, set up the Ladies Masters and, in conjunction with the Tennis and Rackets Association, set up and took on the running of the Billy Ross-Skinner British Invitation Mixed Doubles tournament. For much of this time, Lesley, whose game was based on classic shot play and a superb serve, continued to play tennis at the highest level, including winning the World Championship doubles and the British Open singles in 1987, as well as becoming the first lady professional in Britain. 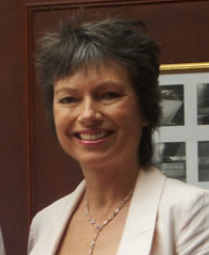 Katrina made her name as British champion from 1983–86. A player of great natural talent and strength, her flamboyance at times gave the impression that even she did not know what stroke she would play next! During her career she was World Doubles champion (1987), French Open champion (singles (1986 and 1992) and doubles (1992)) and US Open champion in 1995 (singles and doubles). Penny Lumley (previously Fellows, née Bland) has had a phenomenal career. The ladies’ game was extremely lucky when in 1985 Penny became bored with lawn tennis and took up real tennis. Within 4 years she was the World Champion, beating Sally Jones (now Grant) 6–4, 5–6, 6–3 in Philadelphia. She dominated the game for the next 15 years, from 1989 to 2003 she won 6 (out of 8) World Championships (singles) and was runner up once. In that period she played in every World Championship doubles final, winning 6 times. She did not enter in 2005 but played in the 2007 World Championships in Manchester, winning the doubles with Charlotte Cornwallis and being runner-up to Charlotte in the singles. She won the inaugural LRTA International tournament in 1998 and took the title at the next 3 tournaments. Penny was the British Open singles champion 12 times between 1989 and 2004, including an unbeaten run of 8 victories from 1995 to 2002, she won the doubles title 10 times between 1991 and 2008. She was also successful abroad, winning the US Open (both singles and doubles) 6 times, the French Open singles 7 times and the doubles 10 times, and the Australian Open singles 3 times. In 1996–97 she achieved the ultimate when she won the Grand Slam, taking the British, French, American and Australian Opens as well as the World singles and doubles titles. But life was not all tennis for Penny, as well as winning an unprecedented number of titles, she also managed the small matter of having 2 children! Penny’s elegant style of play combined an ability to retrieve anything and everything for as long as was needed with that of hitting an unbeatable length shot on the floor; all this accompanied by a very calm, controlled temperament. Penny was undoubtedly one of the outstanding sportswomen of her time. In addition to her many titles she received numerous other accolades. The Tennis and Rackets Association awarded her the Baerlein Cup, for the best tennis performance by an amateur, 6 times and the Greenwood Trophy in 1989 for the most improved tennis player of the year. She was the first lady to be given these awards. In 1999 she was presented with the Medal of the French Republic for her achievements in tennis and in particular for her 7 French Open singles titles. In 2000 she won the Unsung Hero/Heroine category and the overall Grand Prix Prize at the Best of British Awards for Great Sporting Achievement. She was awarded the M.B.E. in 2004. In 2011 Penny was inducted into the International Hall of Fame of the US Court Tennis Association, only the second lady ever to receive this award. With a marvellous temperament and elegance on and off the court, Penny was and is a wonderful ambassador for the game. 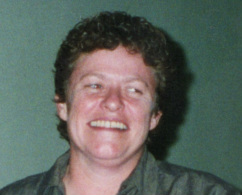 Sally was twice runner-up to Penny Lumley in the World Championship (1989 and 1991), each time taking the match to three sets; she was world champion in 1993 beating Charlotte Cornwallis in Bordeaux and she and her regular partner, Alex Garside, took the World doubles title twice. She was twice British Open singles champion (1988 and 1990) and British Open doubles champion seven times, six of those with Alex Garside. Strong and athletic, and a talented all-round sportswoman, Sally was a British schoolgirl lawn-tennis champion, played lawn tennis for Warwickshire, squash for South Wales, and managed five blues at Oxford. 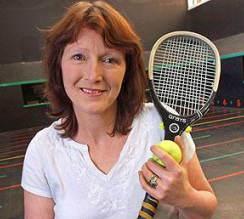 Sally was Britain's first networked woman TV sports presenter in the late 1980s and this gave her the chance to feature women's Real Tennis in various programmes. As a sports journalist, she has made a valuable contribution to the growth of the ladies’ game. Charlotte developed an aggressive style of play, hitting the ball hard and making strong cut shots with ease. Her strong, physical style of play contrasted with Penny Lumley's style, though they complemented each other when they played doubles together. Charlotte became the dominant player in the ladies’ game in the mid - 2000s and was the first lady to achieve a single figure handicap, her best was 8. She turned professional and found time to coach and generally promote the game (including appearing on television) as well as being unbeatable on court when she was at the height of her powers. She won the World Championships singles and doubles 4 times, including a run of 3 in 2005, 2007 and 2009, and the LRTA International Invitation tournament in 2006 and 2008. She was British Open singles and doubles champion 7 and 4 times respectively, she won the US Open singles 6 times and the doubles 4 times, the French Open singles 7 times and the doubles 6 times and the Australian Open singles twice and the doubles 3 times. Charlotte achieved the singles and doubles grand slam in 2008/9. She won the Browning Cup in 2005, the only lady ever to win this professional handicap tournament. The T&RA awarded her the Warburg Salver for the best performance by a Professional 3 times, she is the only lady ever to be given this award. It was a huge blow to Charlotte and a great loss to the game when she was forced to retire through injury in 2009. Karen was the young tennis amateur at MCC, having graduated in Economics from Cambridge University in 2010 and completed the Graduate Diploma in Law last year. She started playing real tennis at the age of 8, winning the British Junior Girls' Age Group Championships 5 times. However, badminton was her main sport until she was 17, competing as a junior international for six years and winning European gold and bronze medals. 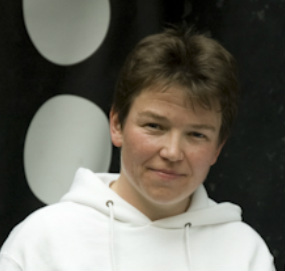 Karen won the World Championship Doubles (with Charlotte Cornwallis) in 2009, and reached the Singles finals in both 2009 and 2011. She won her first Open Singles title at the 2009/10 French Open, and has won a number of Open Doubles titles, including the British Open Doubles and USA Open Doubles in 2011. Karen played numerous sports at university level, gaining Full Blues in Real Tennis, Badminton and Squash, a Half Blue in Eton Fives and representing the University at Cricket. 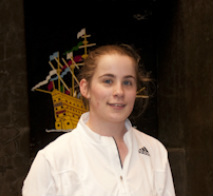 She still plays Fives, winning the Winchester Fives Nationals and reaching the final of the Eton Fives Nationals.